The issue was discovered by security researcher David Leo, who published a proof-of-concept exploit for it. 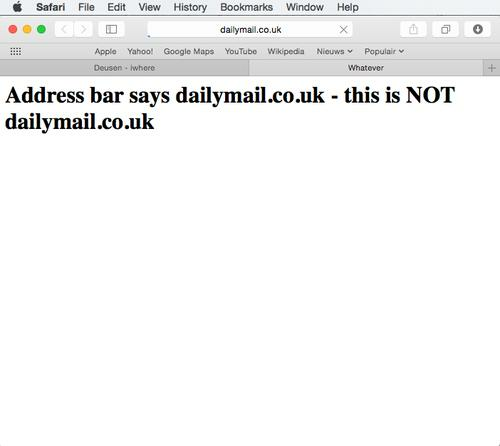 Leo's demonstration consists of a Web page hosted on his domain that, when opened in Safari, causes the browser to display dailymail.co.uk in the address bar. The ability to control the URL shown by the browser can, for example, be used to easily convince users that they are on a bank's website when they are actually on a phishing page designed to steal their financial information. Leo's proof-of-concept is not perfect and its behavior is somewhat inconsistent. When opened in Safari on iOS, the spoofed URL flickers and sometimes the user can briefly see the real URL. That's because the attack code is designed to redirect the browser to the spoofed URL, but before the content is loaded, the code reloads the current page. This happens very fast -- every 10 milliseconds -- hence the flicker effect. On Safari on Mac OS X the flickering is much less apparent, so it's harder to tell that something is amiss. "While this proof of concept is not perfect, it could definitely be fixed to be used by phishing attacks very easily," said Manuel Humberto Santander Peláez, a handler with the SANS Internet Storm Center, in a blog post. The exploit was tested successfully on an up-to-date MacBook Pro running OS X 10.10.3 and Safari 8.0.6, as well as on an iPhone 5S with iOS 8.3.